Contemplative arrangements by stone balance artist Michael Grab. The video was shot in a variety of locations around the world including England, Netherlands, Germany, Italy, Croatia, Romania, Taiwan, Costa Rica, and the United States. Grab began this practice in 2008 while exploring Boulder Creek in Colorado and has since evolved into a creative passion. He states that he is "constantly in awe at the stillness, let alone possibility, of such precarious formations, amidst sometimes very turbulent conditions" and that "this reflects our own potential to maintain a still-point amidst the variety of challenges we each face throughout our lives." All structures were balanced with my two hands, then documented, then taken down when finished (practicing a "leave no trace" ethic as i go)... each structure took maybe an average of an hour to complete including finding rocks, and puzzle solving toward a "beautiful and elegant solution." Some take minutes. Others, days of contemplation, sometimes frustration, and/or simply feeling through the zero points. The most intriguing aspect for me is the variety of stone families around the world. A whole climate system may have a similar thread of rock families but within that climate, each creek, each cove, becomes distinct from the rest. even down to smaller nooks and pockets in each. 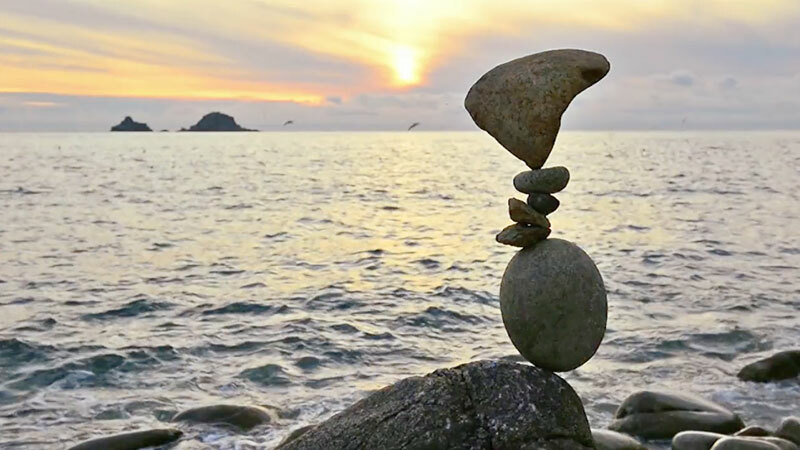 Contemplative arrangements by stone balance artist Michael Grab.